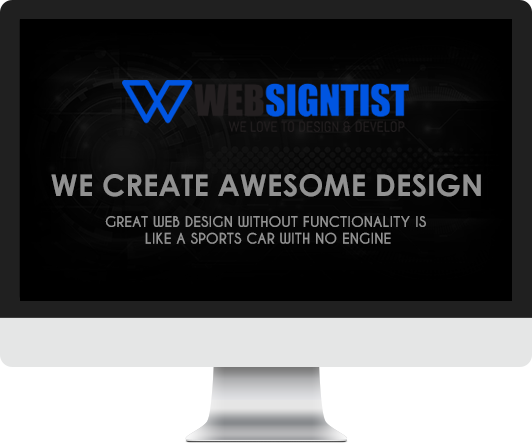 "GREAT WEB DESIGN WITHOUT FUNCTIONALITY IS LIKE A SPORTS CAR WITH NO ENGINE"
Websigntist.com offers web solutions which prove to be effective tools of marketing and ensure return on investments. Years of experience have enabled us to give our customers affordable, custom based packages which surpass the expectation of the clientele. Mirroring on the goals and objectives of the customer’s enterprise, we give you web design and development services which present you in efficacious ways to your potential customers. We are web design & development company striving to create just the right website for each client. We can help you have the website that will not only look great, but meet the needs of both you and your target audience. We wanted a screen as vivid as your imagination. A screen where everything you see is vibrant, detailed and sharp, we created the world's highest-resolution website display. The only thing that even comes close? Websigntist ensures 24/7 technical support for all customers. A unique way enables transparent and seamless support in multiple way from websigntist's transatlantic team. We are 24/7 here for your support and guidance. Easy to understand means the code is easy to read, whether that reader is the original author of the code or somebody else. It’s meaning is clear so it minimizes the need for guesswork and possibility for misunderstandings. Websigntist.com offers the client incredible turnaround times. Websigntist.com's project managers use a systematic rapid development procedure, based on object-oriented programming, to make this possible. You will be surprised how quickly we can have your site up and making money. The final and most overlooked aspect of site development is hosting. We offer reliable, secure and super-fast hosting services. Websigntist offers web designing & development services for its customers. We specialized in all sorts of dynamic websites from normal business websites, news websites to e-commerce solution. Complete range of web designing & development solutions are provided by foremost web design company Pakistan. Through this selection we've focused on distinctive portfolios with engaging layouts, navigation, interface, interaction or transitions. It hasn't been an easy task as it's quite common to find over and over again the same layouts, designs, structures and navigation patterns of the classic galleries. 10143 Ferndale Street Philadelphia, PA 19116. 51-C, MEZZANINE FLOOR, 21ST COMMERCIAL STREET EXT., DHA PHASE II, KARACHI..
Suite # 04,First Floor H.J Center, Gulshan-E-Iqbal Block 13/B, Karachi - Pakistan.